Last week I posted Part 1 of my migration from Microsoft Office to Google Docs. In that post, I outlined the foundations of why I moved and the process of migrating your files from your PC or other cloud storage to Google Drive, how to setup offline access and the importance and power of Chrome Extensions as part of that offline work. In Part 2 I’m going to cover the ins-and-outs of Google Docs, the document processing app. I’m going to cover using the app from the perspective of a PC running Chrome, a Chromebook and the Google Docs app on my Android phone (OnePlus One) and tablet (Samsung Galaxy Tab 4). I’ll cover the pros and cons of Google Docs versus Microsoft Word and some of the things that you will need to keep in mind if you are thinking of switching. This same methodology will repeat over the course of the next few weeks when I cover Google Sheets and Google Slides. Take your time. You will find that the majority of features in Microsoft Office are in the Google apps but they will be in different places. It may take you a few menu clicks to sort it out. Be patient. Give it a chance. Sure it may turn out that it isn’t right for you and your needs but I would suggest trying the experiment over a week or two before you make a final verdict. It isn’t as big a migration from say a PC to a Mac but it is similar to moving from Internet Explorer to Chrome in many ways. Same thing, but bits in different places and this process or that process may be a little different. Rome wasn’t built in a day and moving from one way of editing your documents to another won’t be done in a day either. Give it an honest try and take your time. With that foundation laid, I’ll start by discussing my move to Google Docs first as this is by far the most used Office app for me. I spend a huge amount of my time writing documents or editing them and if I’m not in Google Sheets, I’m in Google Docs. As a documents app, Google Docs is really impressive. It has all of the most commonly used features like paragraph layouts, fonts, headings, hyperlinks to text and even the ability to track changes and comments. You also have the ability to insert tables and images into your document as you can see from the screen capture. Functionally, using Google Docs is much like using Microsoft Word. You open up a document and you can start editing that document straight away. One of the benefits of using Google Docs online is that you never have to press save. It is continually backing up any changes you make on-the-fly. Performance wise, Google Docs performs exceptionally well. Obviously there is a certain level of dependency on the underlying hardware of your PC but Chrome itself is lightweight when it comes to system resources and given that Docs runs within Chrome, you gain that benefit. In my experience of using the Docs app, I found that start up times were far faster than Microsoft Word on my PC. There was no issues with saving files while I typed nor quickly accessing them when I wanted to edit them. Contents. Can do it in Word, can’t do it in Google Docs – at least not out-of-the-box so to speak. Like the Chrome browser, there are things that you can add to Google Doc that will give you more functionality. Through the Add-ons menu you can add things like a Table of Contents applet that works inside Docs. There are dozens and dozens of these to chose from so if there is a function you don’t see you need, look in the Add-ons. They are free. The other thing that you cannot do in Google Docs or the other apps for that matter is password protect a file. If you have a document or presentation that you want to password protect, there is no easy way to do it in Google Docs and if you try to open a password protected file, you are out of luck. I have a few finance sheets that I password protect and for those files, I store them in OneDrive and edit them via Office online. Fortunately I don’t have a lot of these types of files but it is a pain regardless. This is the single feature I wish was added to the suite because frankly through add-ons, I can solve most any other problem save a few complex formulas in Google Sheets. For 90+% of the users out there, I believe that Google Docs could and should do the job for them. That would include small businesses and even small enterprise level organizations. In my three weeks or so of solid use of Google Docs, I’ve yet to need to power up Microsoft Word. I don’t think I’m alone either. I should start this section by pointing out something that many of you will already know. A Chromebook, for all intents and purposes, is a Chrome browser with a keyboard. Yes I’m selling it a little short but fundamentally that’s what it is when you get down to the bare metal. Understanding that however is key when I say that there is functionally no difference between running Google Docs on your PC versus running it on a Chromebook. You are running the app – online or offline – in Chrome on both devices. It’s the same application because it is written to run in Chrome so there are no feature differences. In my case, I’m using an Acer C670 Chromebook. When I use Google Docs on it, I have no issues with performance or functionality. It works exactly as it does on my Lenovo T440S laptop running Windows 10. To start editing a file, I just tap on the Google Docs “app” that is on my Chromebook. 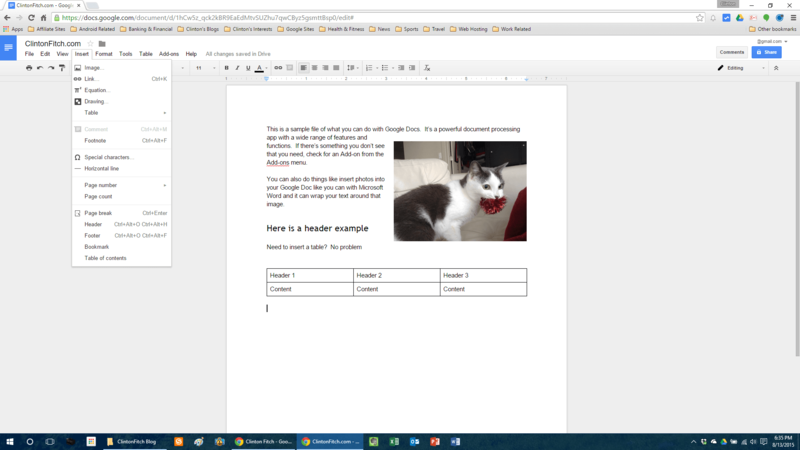 That in turn launches the Google Docs site where I can edit the file. The nice thing is that through these apps installed in Chrome OS, I don’t necessarily have to be online. I can edit a document that I have synced to my Chromebook (all Google Docs are sync’d by default) and when I am connected back to the Internet, my changes are automatically synced with my Google Drive account. The Google Docs app for Android is a rich and powerful experience. 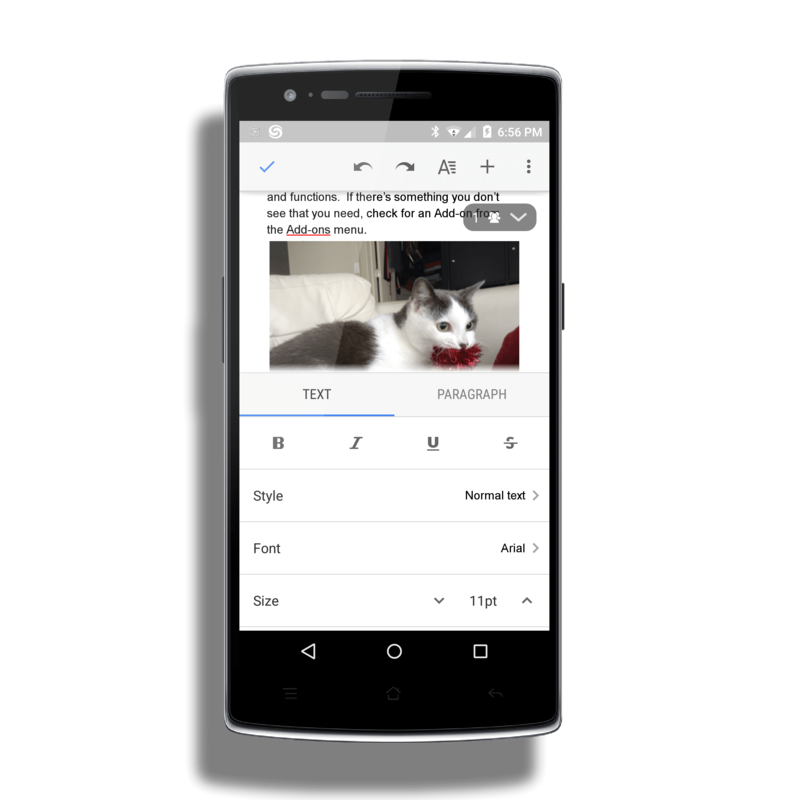 Much like Microsoft Word for Android, Google Docs for Android lets you quickly edit documents but also gives you a tremendous amount of flexibility in your editing. You can change things like paragraph layouts, text fonts and positioning, insert photos and tables into the document, all of which is saved in the background as you edit to your Google Drive account. What I like about the Google Docs app is that it isn’t a subset of features compared to Google Docs in Chrome or on a Chromebook. All the features are there so your mobile device – be it an Android phone or tablet – becomes an equally powerful way to edit docs without having to be tied to your desktop. Indeed Google continues to update this and the other Docs apps with ever increasing power. A case in point is the recently announced ability to view Print Layouts in Google Docs for Android, a feature that has been asked for by many users of the app. Personally I tend to use Google Docs on my Galaxy Tab 4 when I’m traveling on an airplane. Generally I’m flying in coach and we all know that space is limited, especially if the person in front of you leans their seat back (which makes using a laptop or Chromebook tough). I can sync up my docs to my tablet then while in flight work on documents without having to pay the insane in flight Wi-Fi charges. Then, once on the ground in the airport or hotel, I sync back up to my Google Drive and all my changes are there on all my devices. My move from Microsoft Word to Google Docs has been far easier than I expected. I initially thought that I would have challenges around editing documents, particularly on my Android phone, but that has been unfounded. Indeed from a productivity perspective, I find my ability to get work completed just as easy as it was before and in fact increased on mobile devices because of the completeness of the Google Docs for Android app. My only real complaint is not being able to password files in any of the Google Docs apps. This is something that I personally want to see, not so much for Google Docs but for Google Sheets. Hopefully, as Google did with Print Layout, they will add this feature soon to these apps.